MBM’s Aerocut Velocity is the refined model of the Aerocut Classic slitter/cutter/creaser and features enhanced productivity and user-friendliness. 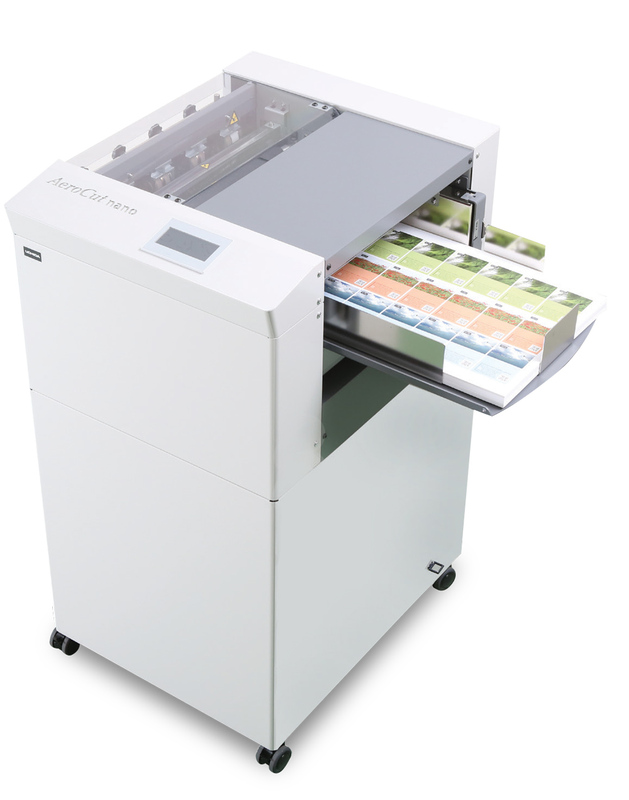 Feeding is an important and essential part for any print finishing device. This machine has an innovative patented feeding mechanism, that drastically reduces the risk of double feeds and mis-feeds. An optional perforating unit is located inside for an accurate registration. The Velocity is twice as fast and includes more adjustments than base Aerocut Classic with a greater (4”) sheet capacity.The robust all-metal construction keeps top level accuracy and finishing quality on every job. Includes 268 preset cutting jobs and up to 150 additional custom programs can be stored in memory. 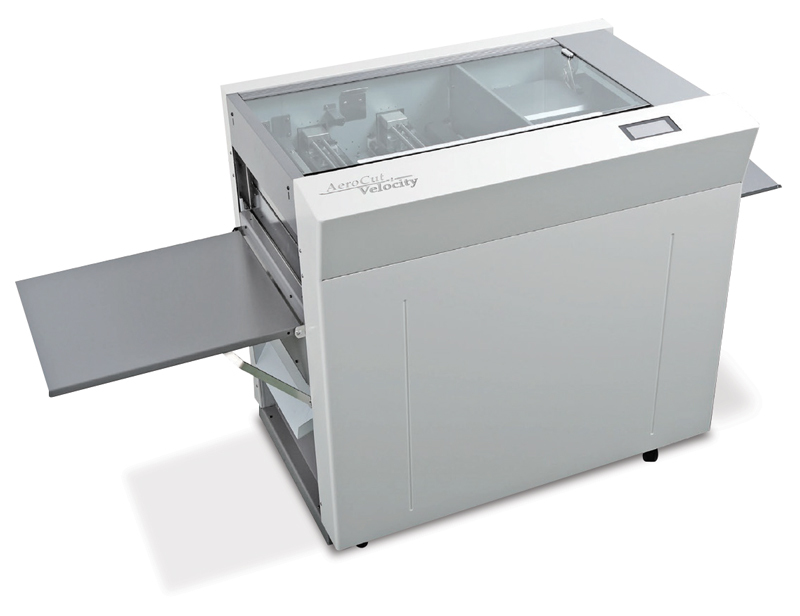 The Velocity is an ideal solution for finishing, especially for short-run digital printed applications, such as business cards, post cards, invitations, greeting cards, leaflets, tickets and more. Flex mode allows operators to cut multiple size cards from a page and add the desired number of creases on these; It enables designers and printers to create new aspects of applications. Self-correcting cut mark registration function and air suction feed system ensure accurate cuts every time. Channel creasing allows the Velocity to offer world-class quality creases on digitally printed stocks. Creasing pressure can be adjusted in 5 levels instantly by shifting the lever. Magnetic paper guides are easily adjustable for various stock sizes. The handy business card collection tray snaps into place for neat stacking of finished cards. The Velocity also features 2 single blade slitters to trim the top and bottom margins, and 2 double blade slitters for center gutters and precise accuracy. The durable blades cut stocks up to 400 gsm. The air-suction top feeding system easily feeds coated, digital, gloss and other stocks precisely without damage. Includes the Lytrod VisionDirect software to simplify the task of formatting, imposing, and adding personalized information to documents for fast and efficient cutting on the Velocity. This entry was posted in Paper Cutting, Slitter/Cutter/Creasers, Vendor News and tagged Aerocut, Business Card Cutters, MBM, Paper Cutting, Slitter/Cutter/Creasers, velocity on September 21, 2016 by Billi Jean Johnstone. Article provided by MBM Corporation.March 16, 2016, Carrie Ford, Advertising Manager. The indoor air we breathe has an under-appreciated influence on our well-being. Statistics reveal that we spend up to 90 percent of the day indoors – more time than ever before. Considering this, not a lot of effort is needed to grasp the impact that air quality can have on our well-being. Those who can work in naturally healthy air work better because they feel fine, can clearly perform better, and are sick less. But good air is often hard to find in the office. The new IDEAL air purifiers with ionic technology are the ideal solution for improving indoor air. The product line consists of five new air purifiers with performance sizes for spaces ranging from 150 square feet to 1,000 square feet. All five models are equipped with the highly effective AEON Blue® cleaning system, which scrubs the room air more effectively than almost any other air purifier – using high-efficiency, multi-level filters. This innovative and effective technology is a winner. A six-stage cleaning system, a filter combination and built-in plasma cleaning technology, cleanses the air of 99.97% of pollutants. IDEAL provides a specific remedy and offers a whole new product range that draws on the ideas of nature. Fine dust, pollen and other allergens, viruses, bacteria, mold spores, pet dander, cigarette smoke and even chemical fumes and odors are filtered out from the air with great effectiveness. These air purifiers are also perfect for allergy sufferers. In addition, the IDEAL air purifiers enrich the air with negative ions. Studies show that in areas of air with a high accumulation of negative ions the oxygen content of the blood increases. All without creating any ozone. This simple and natural principle provides for a variety of positive and tangible effects. View the NEW Line of Air Purifiers Here! This entry was posted in Vendor News and tagged Air Purifiers, IDEAL, MBM on March 31, 2016 by Billi Jean Johnstone. As spring inches closer and closer, we wanted to share a few interesting facts and tips on shredding to help get you ready for some good spring cleaning! Did You Know: According to a 1988 Supreme Court Ruling (California vs. Greenwood), when a person throws something out, that item is now the public domain. Any piece of material may be taken without permission. Tip: Use shredded paper in your compost pile. Tip: Donate shredded paper to animal shelters. Did You Know: Approximately 1 bag of cross cut paper shreds equals 5 bags of straight cut paper shreds. Security and liability are concerns for every business owner. Eliminate risk with MSL’s Flint Shredders’ line of commercial paper shredders and hard drive shredding machines. We carry a wide model range and variety of paper shredders. Contact us for additional information or CLICK HERE to check out our models. This entry was posted in Tips & Advice, Uncategorized and tagged destroyit, Flint Shredders, MBM, paper shredders on March 6, 2015 by MSL. Stable air suction feed system featuring InstaSet Bar and touch screen for accurate slitter positioning. Stable air feed mechanism takes a wide range of paper stocks. Cuts and cross cuts prints in one pass. Elevated feed table separates digital stocks to avoid mis-feedings, damages and roller marks. Density sensor for true double feed detection. 2 single blade margin slitters and 2 double blade gutter slitters are easily adjustable for various stock sizes. InstaSet bar indicates and fixes slitter positions accurately. Intuitive touch screen holds 16 pre-programmed jobs and 40 customized jobs. InstaSet Bar – Unique InstaSet bar indicates and fixes slitter positions accurately and can be easily adjusted manually without tools. Stable Feed Mechanism – Stable upper-belt air suction feed system elevates separate digital stocks to avoid mis-feedings, damages and roller marks. Intuitive Touch Screen – The touch screen control module comes pre-programmed with 16 jobs and can store up to 40 additional custom programs. For additional information about the MBM AeroCut Nano, visit us online at www.midstatelitho.net. This entry was posted in Vendor News and tagged Aerocut Nano, Digital Finishing, MBM on November 21, 2014 by MSL. Major businesses, including an insurance company, contracted with Cintas to destroy their customers’ records. The police investigation is outlined in a search warrant for Doucet’s North Fort Worth home. In a search of the house last week, police seized computers, cell phones and other items after investigators said they found a victim’s check in Doucet’s trash. Fort Worth detectives said they confirmed Doucet was a truck driver for Cintas and that the thefts involved Cintas’ customers on his route. Investigators also said they confirmed Allstate was one of the businesses on Doucet’s route. Using a shredding service is putting your company’s security in the hands of strangers. Shredding at the source is the essential security measure. 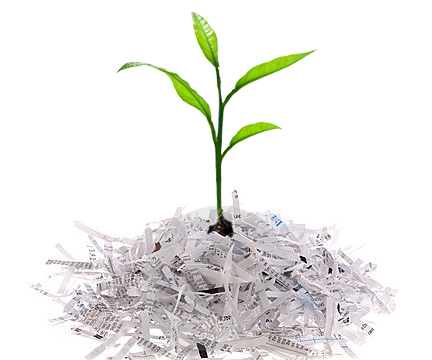 View our shredding solutions by CLICKING HERE! This entry was posted in Paper Shredding, Shared Articles and tagged destroyit, ID Theft, MBM, paper shredders, shredding company, theft on July 15, 2014 by MSL. Check out MBM’s Top Selling Cross Cut Destroyit Paper Shredders! Destroyit cross cut shredders are the perfect balance between strip cut and high security models. By cutting the paper both vertically and horizontally; you end up with a smaller and more secure particle, meeting security levels 3 or 4. Cross cut shred bins can also hold five times as much cross cut shred volume than it can of strip cut shred, thus being more space efficient and bag thrifty. Every cross cut model’s cutting shafts come with a lifetime warranty from MBM. Destroyit paper shredders from MBM set the standard for strength and durability. Destroyit shredders do more than just shred paper, they are an essential part of your security program. For additional information, contact MSL at 1-800-343-4231 or visit us online at www.midstatelitho.net. This entry was posted in Paper Shredding and tagged cross cut, MBM, paper shredders, Shredders on June 5, 2014 by MSL. Check out MBM’s top Selling Shredders! This entry was posted in Paper Shredding and tagged deskside, destroyit, MBM, security, Shredders, shredding on May 12, 2014 by MSL.